The Orioles will welcome Matchbox Twenty's lead guitarist, Kyle Cook to perform the National Anthem on Monday, August 19 and YOU could win an opportunity to meet him before the game! 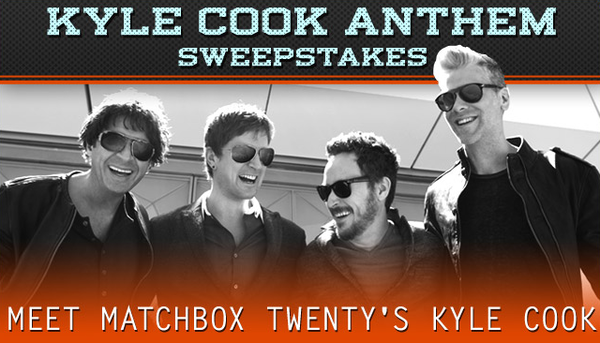 Enter the Kyle Cook Anthem Sweepstakes for your chance to win two (2) lower-box tickets for you and a guest and a pregame meet and greet with Kyle! Five (5) lucky winners will be announced. SEE KYLE COOK PERFORM THE NATIONAL ANTHEM ON AUGUST 19! Also, The Orioles have a special offer for you Matchbox Twenty fans! Simply use the coupon code MB20 when purchasing tickets to this 8/19 home game and you'll get a 20% discount.